Each tablet contains: Doxycycline hyclate: 100 mg.
Excipients: cellulose microcrystalline, calcium phosphate dibasic, crospovidone, maize starch, magnesium stearate, sodium starch glycollate, talc, sodium laurylsulfate, colloidal silica. All the infections caused by Gram+ and Gram- germs susceptibles to tetracyclines. Hypersensitivity to tetracyclines or to any of the excipients. Obstructive esophageal disorders, such as narrowings of esophagus or achalasia. The product is not indicated in pregnant women and in children younger than 8 years of age. As it was observed with other antibiotic agents, treatment with tetracyclines can cause super infections from resistant bacterial agents or mycetes. The possibility of enterocolitis caused by resistant Staphylococci should be considered. In the treatment of gonococcal infections, the risk of masking the manifestations of a co-existing syphilys should be considered; in these cases, perform the serum tests for at least 4 months. Courses of long-term treatment require regular check of blood crasis and of liver and kidney functions. During the formation of bone tissue, tetracyclines can give way to a stable calcium complex, without particular harmful effects in humans. The use of tetracycline drugs during tooth development (pregnancy, infancy and childhood up to 12 years old) may cause permanent discolouration of the teeth (yellow-grey-brown). This adverse effect is more common during long term therapy but has been observed following repeated short term courses. The administration of doxycycline at high doses and for period longer than 2 weeks, can cause disorders of the liver function. Therefore, the liver function should be monitored and the treatment should be discontinued in case of abnormal reactions. Reactions of photosensitization appearing as an exaggerated skin reaction to the sunrays and to ultraviolet rays, can appear during the treatment in predisposed subjects. It is appropriate to view this event by preventing the direct exposure to the sunrays and discontinuing the treatment as soon as a skin erythema appears. Excretion of doxycycline does not change in subjects with impaired renal function. However, in these patients it is advisable to proceed carefully possibly reducing the doses. In subjects with renal failure, even normal doses of tetracyclines can give way to an accumulation in the bloodstream with possible liver damages. In these cases, it is necessary to adjust the dosage to the degree of renal function. If necessary, test the doxycycline blood levels (which never should go over 15 mg/dl) and the liver function. Moreover, it should be considered that tetracyclines exert an antianabolic action which can worsen states of renal failure. Cases of esophagitis and esophageal ulcers, sometimes severe, were reported. Patients are recommended to take the drug with plenty of water, even during meals, to remain standing for at least one hour after the drug intake and never to take the drug at the time of bed resting. If, during therapy, such symptoms as difficult swallowing or retrosternal pain appear, the drug intake should be immediately discontinued and the opportunity of performing instrumental investigations should be assessed along with the attending physician. In the treatment of patients suffering from ascertained esophageal reflux, it is appropriate to assess also other therapeutic alternatives. The combination with penicillins should be avoided due to the possible onset of interferences between the relevant antibacterial activities. Since tetracyclines depress plasma prothrombin activity, reduced dosages of concomitant anti-coagulants may be required. Antiacid preparations with aluminium, calcium or magnesium, milk and milk-products, products containing ferrous salts reduce the oral absorption of tetracyclines, and should therefore not be administered at the same time. Barbiturates, carbamazepine and phenytoin reduce the half-life of doxycycline. Rare cases of increased plasma concentration of lithium, methotrexate, digoxin and ergot derivatives were reported in the literature after concomitant administration of tetracyclines. The intake of tetracyclines can reduce the efficacy of oral contraceptive treatments. 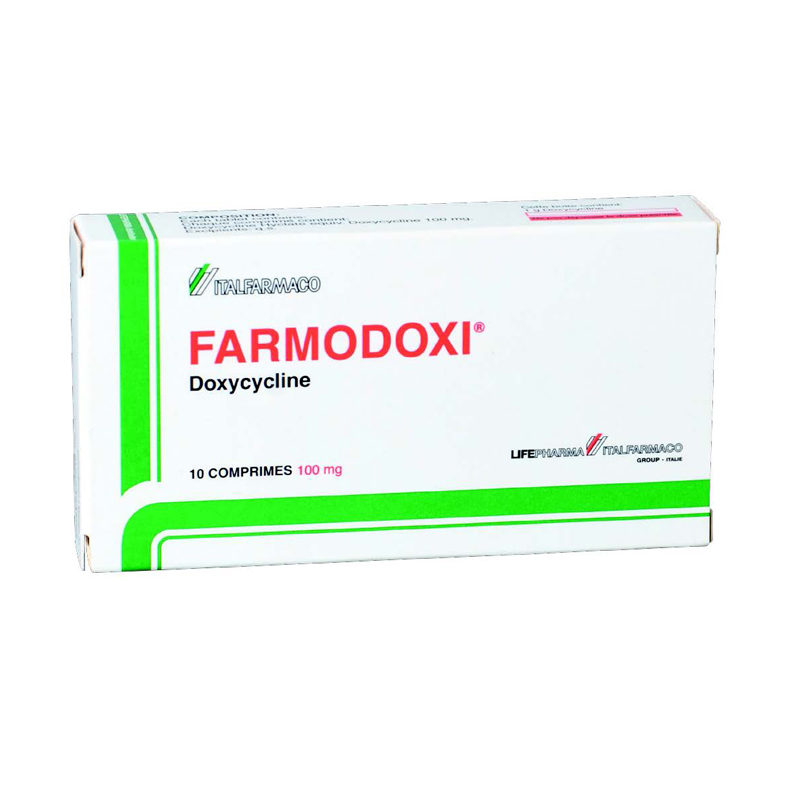 In pregnant and breast feeding women, the use of the drug is contra-indicated, since doxycycline crosses the placenta and can enter the mother's milk. Gastrointestinal effects: nausea, abdominal pain, vomit, diarrhoea, lack of appetite, oral mucosae inflammation and glossitis, enterocolitis, anogenital candidiasis, difficult swallowing, esophagitis, esophageal ulcers, furthered by the intake of the product just before resting and/or with small amount of water. Skin reactions: maculopapular and erythematous rashes can occur. Hypersensitivity reactions: urticaria, anaphylactoid purpura, angioneurotic oedema; rare cases of Stevens-Johnson syndrome were reported. Hematological changes: very rare cases of hemolytic anaemia, neutropenia, thrombocytopenia and eosinophilia were reported. 2 tablets (200 mg) all at once, in the first day of treatment; followed by 1 tablet (100mg) / day maintenance dose. The tablets should be administered during meals with adequate amounts of water (a full glass). The patient should be warned against bed resting for at least one hour after the drug intake. More severe infections need the strict supervision of the physician. In case of infections by Streptococci beta haemolytic (group A) the length of the treatment should be at least 10 days. The length of therapy will depend on the evolution of the infection. However, it is advisable to discontinue therapy only after the disappearance of fever and clinical symptoms. In order to obtain the maximum safety of therapy, it is advisable to carry out an antibiogram in all the cases, in order to ascertain that the strain of germs causing the affection to be treated is susceptible to the action of tetracyclines. In case of overdosage, perform a gastric lavage.